Our Very Own n7thGear Pulls Off Hat Trick!!! In a performance much talked about in the fledgling Project Cars racing leagues, our very own n7thGear aka Pip, Pipster, PIPPY Gofastalot, etc., shut out several grids worth of sim racing veterans, many of them experts at iRacing and professional racers, by competing in 4 races this past weekend, attaining the podium in three of them. Pip drove the Formula Gulf 1000 (above) to a P1 finish at Imola. Watkins Glen, was canceled due to Project C.A.R.S. lobby event hosting issue. P2 finish at Monza, and a P4 finish at Azure. She piloted the SMS Formula C to a breathtaking P1 win after 10 laps of Nurburgring Nordschiefe, The Green Hell, also scoring in game achievements for lapping an opponent, pitting without losing position, and getting them brakes heated up realllll good. Join me in congratulating our Pip on her stellar performance. It's really a great feeling having our web boss putting her money, and her skills, where her mouth is. She is obviously a great driver and a brilliant race engineer, as well as one of the most knowledgeable people I have ever known when it comes to the field of Motorsports. I'm proud to be associated with her and look forward to watching her grow in the business. You guys are going to be knocked out when she starts getting some of her long term plans implemented. I can't wait! Congratulations on an outstanding performance, Sir, nicely done! 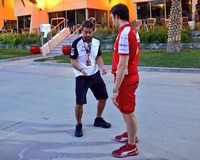 When reached for comment, Formula 1 World Champion Fernando Alonso was speechless, resorting instead to an interpretive dance entitled "All I Wanna Do Is Zooma Zoom Zoom Zoom Like A Pippa Pip Pip"
Awesome stuff...Pipster....not to mention all the grinding you did on RR3.......you are incredible....I am looking really hard at PC. AWESOME!!! Way to go Pip!! Feel free to join me on any/all, just let me know your from here or MMR. Super awesome amazing incredible Pippy! Oops forgot to add stupendous!